Digital display ads aren’t giving appropriate cut–through, the finance sector has the largest under–allocation of TV ad spend, and marketers are still not optimising spend accordingly, a new study shows. In this AdNews exclusive, we take a first look at phase two of ‘Payback Australia’, undertaken by independent marketing analytics company, Ebiquity. In partnership with ThinkTV, Ebiquity analysed 21 brands over three years across the four categories of finance, automotive, fast–moving consumer goods (FMCG) and e–commerce. The results of the study showed these sectors could increase their return on media investment by more than $1 billion by optimising their media spend towards the most efficient media channels. For e–commerce companies, it means spending less on TV and more on search, and for finance, FMCG and automotive, this means investing more in television and less on advertising platforms such as online display. The study took three years' worth of raw advertising and sales data from the 21 companies and used econometric modelling and a ‘hill-climbing’ algorithm to see how tweaking the media mix would impact the return on investment (ROI). The companies studied included Unilever, Sanitarium, Kimberly Clark and Lindt, as well as major car manufacturers, banks and insurance firms with a combined a media spend of more than $500 million per annum. The report draws on the same categories and companies used in last year’s Payback Australia study, but takes it a step further by seeing what would happen if companies optimise their media mix towards effective channels. Last year’s report found that for every dollar spent, TV delivered the largest ROI in automotive, FMCG and finance. For e–commerce, the study found that radio and search were superior for the three companies in this category. Aside from TV generally delivering a far better return than other channels, there was another common theme worth noting: online display performed poorly across all categories while other media channels varied depending on category. Ebiquity’s ‘Payback Australia’ study applied a top–down, longer–term lens to estimate the average sales return from media investment. This means short–term tactics to drive sales are taken into account and traditional media channels that may influence a consumer, over a longer time period were factored into the equation. Additionally, the approach controlled the impact of all other key sales drivers, such as price, promotions, weather, availability, etc. All media return investment curves adhere to the law of diminishing returns. This means there is always a point where spending more on advertising is no longer effective and efficient. 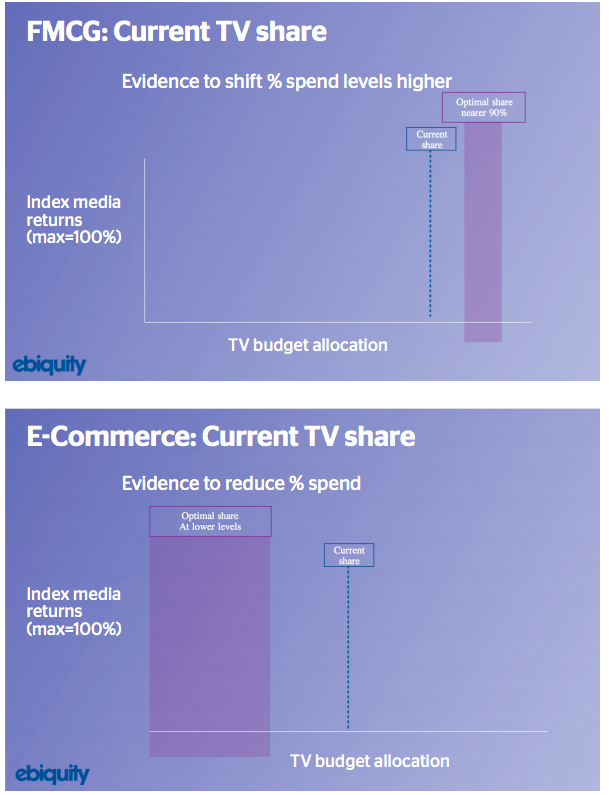 With this in mind, Ebiquity’s second phase looked at the four categories and recommended what the optimal share for TV spend should be in each category and compared that to the actual share. For FMCG, the TV share of media budget allocation is 78%, but the optimal share is nearer to 90%. In the automotive category, the current share is 53%, but the optimal share should be 70%–80%. For e–commerce, the current share is 55%, but an optimal share for these brands is actually lower — between 10% and 30%. Ebiquity said this could be due to brands being at different stages in their product life cycle, and these companies typically don’t have a shopfront and rely heavily on search. The study results showed the finance category had the largest under–allocation of TV budget spend. Currently, the share of TV investment is 33%, but the analysis suggests the optimal share should be nearer to 90%. Ebiquity told AdNews such a large jump would not be recommended and a minimum allocation of 60% is a safer bet. 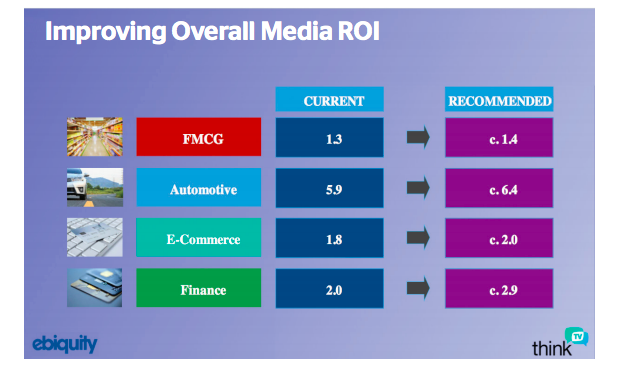 These moves would improve the overall media ROI for each category (see chart Improving Overall Media ROI below). If the results for this sample are extrapolated across their respective industries (an annual media spend of $2.25 billion across finance, auto, FMCG and e-commerce), Ebiquity estimates there would be an increase in the revenue return by almost 50% (about $1.1 billion), which it says is a conservative estimate. AdNews asked Ebiquity Asia–Pacific managing director Richard Basil–Jones why marketers and media agencies are not placing the optimal amount on TV despite several studies consistently showing it is the most effective medium for advertising. “There is both the herd mentality from advertisers to follow the ‘new’ media as well as more money to be made in the digital buying process than traditional media,” he said. While TV is under–invested in most categories, it begs the question, is there too much money being invested in online display advertising? Ebiquity’s analysis of online display looked at the impact of impressions and clicks on sales revenue. It is important to note that not all forms of online display advertising are poor or ineffective. Basil–Jones believes one of the contributing factors to the poor performers is the long–tail of cheap inventory that is often bought through programmatic trading desks. Factors such as ads being served below the fold, ad fraud and the programmatic ‘tech tax’ all contribute to its low effectiveness. 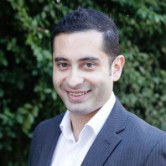 Joey Mui, an analyst at fund management firm, Merlon Capital Partners, pointed out the flight away from TV and other traditional media channels has coincided with a rise in programmatically traded media and the greater focus on marketing designed to generate short–term sales rather than brand building. “We agree that headline ROI and targeted reach of digital is an attractive proposition,” Mui said in an analyst note recently. Although it is always easy to point the finger at media agencies for the flight to digital, it is not entirely fair. Marketers are often under budgetary pressure and sometimes advise agencies to focus on the media more likely to deliver short–term ROI, which suits digital media options. In fact, agencies often advise clients to have a healthy mix of media and to also use marketing mix modelling attribution to measure the media effectiveness. Mindshare head of business planning, Sally Hellyer, said clients don't always take the right path. “When clients have gone down the route of only looking at last–click attribution and they start to put all their money into where they see their last conversion came from, they actually start to see business performance drop off because they're not actually investing in that upper funnel activity,” she told AdNews. Hellyer says marketers now realise they need to focus on brand building as well, which is where media like TV and outdoor are stronger. Mui said there’s signs marketers are starting to push back on digital and return to TV and that companies are becoming more sceptical about how their digital dollars are being spent. 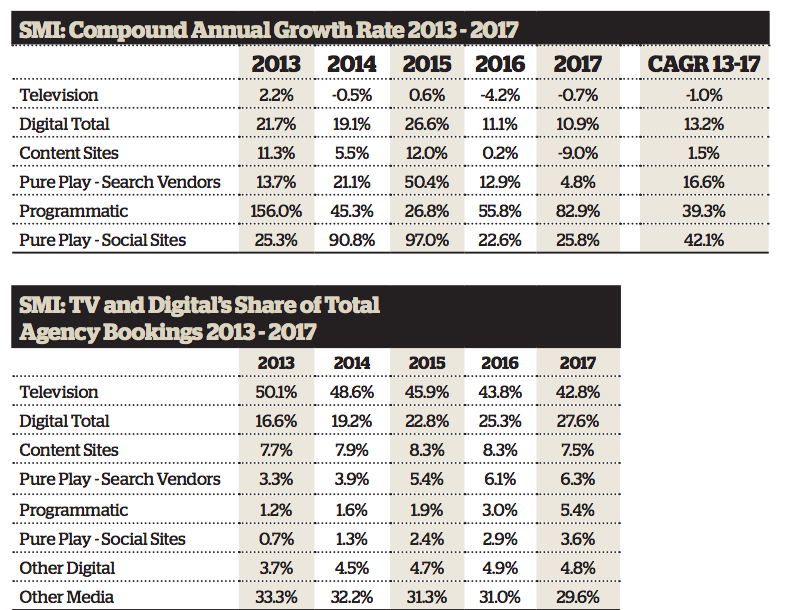 “Further, both locally and globally, advertisers are beginning to see the impact of the over–allocation to digital on their brand strength and longer–term sales trends,” he said. Although Mui is unsure if the investment back into TV represents a “cyclical pull–back or a permanent stabilisation” but he believes that rate of decline should moderate. SMI figures from 2013 to 2017 add weight to this view. And while TV’s share of media spend reduced from 50.1% in 2013 to 42.8% in 2017, it only contracted by one percentage point between 2016 and 2017. Despite the share of spend in programmatic lifting to 5.4%, this is still a relatively small share of the overall pie. 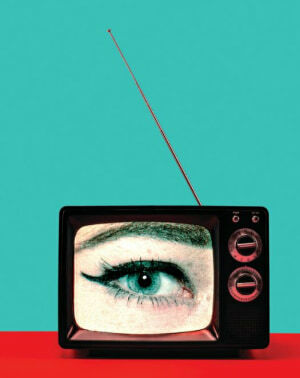 This first appeared in-print in the July edition of AdNews magazine.